This is the third of a small series of posts on computer ergonomics and how I’ve banished computer-use-related pain. As always, I have no affiliate links, kickbacks, nor relation to the companies whose products I’m reviewing, and these reviews are simply posted as a service to the internet in general. For full background, read the first post in the series here and the second post here. Between the Rollermouse and adjustable-height desk, I was 90% pain free. But there was one more area which still needed some help. Your keyboard should be at a height where your forearms are roughly level typing on it. Your mouse should be as near to the keyboard as possible. I’ve used (for many years) an Apple Wireless Keyboard, which is a great little unit, and its compactness helps keep the mouse at hand (addressing issue #5). However, even once at the proper height, it has some flaws. First, its’ upward angle encourages vertical wrist-bending (like in the lower right of the diagram above) (Issue #4). 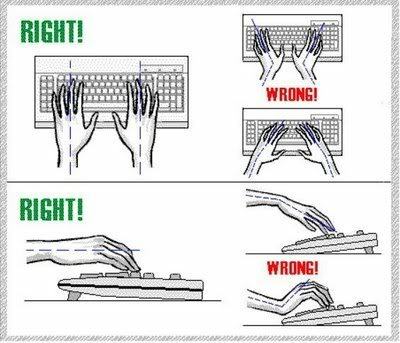 Also, and more problematically, its’ (extremely) compact size forces people with broad shoulders (like myself) to angle the arms together approaching the keyboard, then splay the wrists back out to reach the proper key positioning (Issues #1 and 2). This is a major ergonomic issue for most laptops, as well. I realized that this arm angle issue was perhaps the biggest remaining ergonomic problem I had, so I set out to find a way to fix it. The biggest problem I had was finding a keyboard that was friendly to a broad shouldered person like myself. The majority of ergonomic keyboards address this problem by being very contoured (the exemplar of this class being the Microsoft Natural Ergonomic Keyboard line). This is great for 1-4 above, allowing the wrists and arms to be in a more natural position while typing, but unfortunately, because these tend to be very large keyboards, they tend to to force your mouse to migrate well across the desk, and the contour on the front makes using a Rollermouse nearly impossible. Luckily, it appears that fate wants me to have good ergonomics. 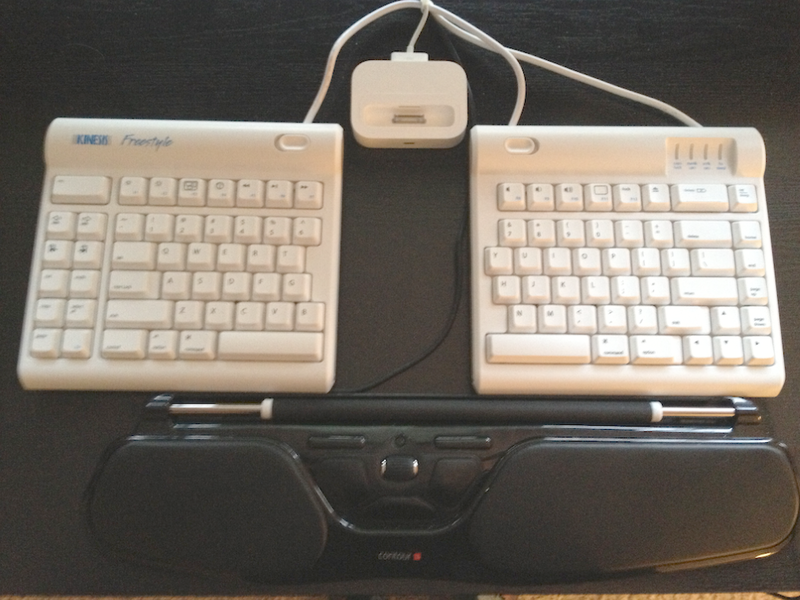 As I was searching around on Craigslist, I happen to find somebody selling a Kinesis Freestyle Solo keyboard for Mac for $40 nearby, so, of course, I jumped on it. On the whole, I very much like this keyboard. The split design allows me to spread the two halves apart and type with my arms at the proper angle, it has more keys than my Apple wireless keyboard did (although it’s very easy to hit the “home” key instead of “delete”, and it’s just a little bit thicker than the roller mouse, allowing me to rest my palms on the mouse’s pads as I type. also, I’ve had no problems at all with the Apple specific button assignments for the function keys, and although it’s a little frustrating that they’re not the same positions here that they are on most modern Apple keyboards, I’ve never had a problem with them being recognized. My one complaint with it is that the key feel isn’t at all satisfying, and the unit itself just feels cheaper than the Apple Keyboard, or even modern Razer devices. The key switches are certainly not mechanical, and although the pressure required to activate the rubber-dome switches is pleasantly light, it still feels rather mushy and noncommittal, and it’s hard to tell whether you hit a key or not. This may be something they’ve addressed in the Freestyle 2, but the moment they sell a version of this with mechanical switches, I’ll be on the pre-order list. Pickiness about switch type aside, I would highly recommend this keyboard to anybody having arm angle issues, or simply looking for ergonomic keyboard that gives you plenty of options and ability to move around your typing position. Although I got an incredible deal on it, if I had to replace it tomorrow, I would gladly pay full retail ($129) for the new version. So, between the adjustable height desk, the roller mouse, and the Kinesis Freestyle Solo keyboard, I’m now in a place where I’m largely pain-free, and I can do a full day of work at the computer, alternating between standing and sitting, with relatively little physical consequence. As you can imagine, I’m absolutely overjoyed by this, and even though it cost me a fair amount of money to acquire the gear I needed to get there, I really do feel like it’s money well spent. In my last post, I want to talk about some of the other steps that you can take to improve your computer usage and reduce pain without opening your wallet.